In the 1950s and 1960s, Sam Phillips and Leonard Chess both started small record labels (Sun and Chess records respectively) that made big stars. Arkansas was filled with small record labels, too, such as Rimrock, founded by musician Wayne Raney, who was profiled the other day. Surprisingly, several of the small Arkansas record labels received press in Billboard magazine, the famous music trade publication. A 1960 ad for a John Tolleson, who performed in the area throughout the late 1950s and early 1960s. 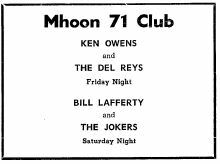 A 1962 ad for Ken Owens and the Del Reys, the latter of whom would evolve into The Cate Brothers Band. It was also reported in the Northwest Arkansas Times that Eagle was hitting the road, promoting the record. At least one other 45 rpm record was released a year later, and it was of Ken Owens and the Del Reys with the songs “You’re for Me” and “That’s Tough.” The Del Reys, which featured Earl Cate on lead guitar and twin brother Ernie Cate on the organ, would evolve into the widely popular Cate Brothers Band. Musicians also listed were Lonnie Watson on bass guitar and Randy Favorite on drums. This entry was posted in Arkansas, Music, Ozarks, Rock and Roll, Uncategorized and tagged Cate Brothers Band, Chance records, Del Reys, Fayetteville, Fred Eagle, John Tolleson, Johnny Tolleson, Ken Owens, Mhoon 71 Club, Ronnie Hawkins. Bookmark the permalink. Great job digging up the names of Tolleson’s band and the detials on Chance Records! Thanks! I think you’re the only one who read this one. Well, you and Marc Reif! Thank you both! What’s the skinny on Ken Owens after the Del-Rays?